Graham Marlowe & Michael Neumeyer - Corduroy Resignation - BFW recordings netlabel - ambient shoegaze indie experimental electronica - music is free! An album of poems spoken by Graham Marlowe with music performed on vibraphone by Michael Neumeyer. "Though some of you may not be familiar with my work (yet), you may recognize some names in the liner notes -- Steve Peplin (guitar) and Steve Gallam (soprano sax) specifically. This album is largely a poetry/vibes "duet" record, but with a tremendous amount of coloring from Peplin, Gallam, and a set of chimes made from discarded keys. 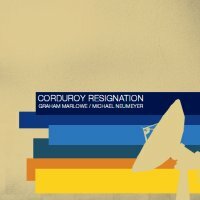 Corduroy Resignation is about letting things go. It's about recognizing that you have nothing left to do but press on with your life as if nothing were wrong. It's not illusory; it's liberating, actually. And that kind of liberation is something I want to share with others. My mentor once joked that if it were 1975, I'd be rich and famous. However, "that was another time..." he said with slight resignation. The longing in his face explains what is needed to give this record its future home(s): your help. The connection between Mike and I (captured on this recording) is just as mysterious as the genre it operates within -- something of a lost relic. But to be pessimistic about popular culture (and mainstream tastes) would essentially be defeatist, and work against the inspiration that drives this material. After all, this project is more or less the next chapter of my first poetry book, Into Light, released in August 2008. We took our lives as far as we could to get this out into the world, but until we gather enough support to release it physically, the record cannot reach the right people. Beauty comes at the strangest of times, and this album makes it all too familiar again." is a percussionist, teacher and composer from Milwaukee.